Dr. Thomas Miller offers porcelain crowns for patients who wish to fix a cracked or fractured tooth, or improve the look and function of discolored or worn teeth. Our crowns are made entirely of porcelain, a strong and durable material that works well to duplicate the look and function of natural teeth. Most crown placements will require two appointments: one to prepare the tooth, create a mold of the tooth, and place a temporary crown, and a second to place the porcelain crown. 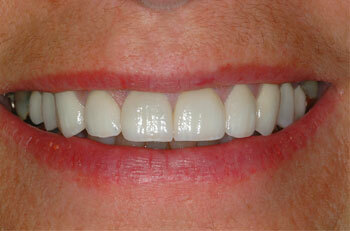 To learn more about the benefits of porcelain crowns, please contact us to schedule an appointment for a consultation. Dr. Miller also offers tooth bonding, which involves the application of a tooth-colored composite resin to correct structural or esthetic problems. If you have unsightly chipping, discoloration of one or more teeth, or unusual tooth gapping, Dr. Miller’s expert tooth bonding treatment can repair these defects. Bonding teeth can also be used to fix small cavities. The bonded material is matched to your tooth shade for seamless, natural correction, sculpted to your unique tooth shape, and applied with a special hardening light for strength and functionality. Tooth bonding is usually completed conveniently in just one visit and offers patients a quick and easy way to improve their smile.